Online registration is now closed. You can still register for the Evansville Half Marathon by visiting the race Expo on Thursday from 4pm to 7pm and Friday from 10am to 7pm. There will be no race day registration. 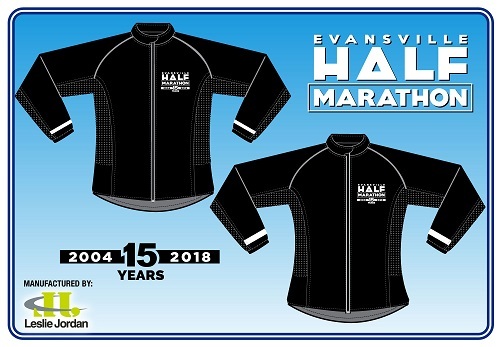 We will start and finish the 2018 Evansville Half Marathon along the Riverfront in downtown Evansville. This beautiful , scenic course will wind through many of Evansville's favorite areas. Highlights of the course are The Greenway, Garvin Park, Bosse Field, Main Street, Bayard Park, historic neighborhoods, and a riverfront finish. For 2018, we have a 15 year commemorative jacket for sale. The Diamond Jacket Fabric does not stretch. Womens Jackets have a slightly loose fit and a defined waist with a bit more room at the hip. The Men’s is a straight fit. When this page loaded, the official time was 2:56:08 AM EDT.